Australia used to have some of the largest homes in the world. I’m not necessarily talking opulent or grand, but physically large. They were enormous, driven by the McMansion trend of house building in the 1990s and early 2000s. Five bedrooms, a media room, multiple living spaces, many bathrooms – absolutely enormous floor plans that families could barely fill. They were excessive – so much so, the trend has reserved in the past decade. Our houses are shrinking as space increasingly comes at a premium – particularly in our major cities, like Sydney. Most simply can’t afford the land those behemoths require. And also, they can often be a pain to live in. It’s expensive and time-consuming to maintain and clean a large home. So, lifestyle and price are now driving a small space revolution in Sydney, and it’s resulting in some pretty nifty alternatives. Here’s why smaller is often better. I doubt you’d find many people who wouldn’t like having a bit more space. Whether you’re talking about an inner-city unit, a narrow old terrace house or one of those cookie-cutter brick homes in the suburbs – space is nice. It gives you room to grow, be it with kids, a pet or a room for your hobbies and the occasional house guest. But the reality is that space costs and in Sydney, it costs a lot. Buyers are moving with the market and are more willing in recent times to accept a little less space. We are more open to shrinking our homes to be able to live in the areas we want, closer to the amenities we desire. All that said though, we won’t live in a shoe box that looks and feels like sardine can. We still want a home that’s pleasant and functional. We won’t trade livability for affordability – and rightly so. Developers are cottoning on to this. There was a period when far too many were whacking up huge towers filled with tiny and cramped units that people don’t enjoy being in. Now, instead, the savvy ones are increasing the ceiling heights to give a more open feel and putting in more windows to let the light through. They’re utilising storage that’s clever and allows flexibility. Similarly, as we increasingly give up outdoor space, community alternatives are popping up. Rooftop gardens, communal dining spaces and everything from veggie patches to beehives are the things that residents of small homes demand. Of course, when you’re investing in property, you should ensure that the attributes of a dwelling aren’t a burden. 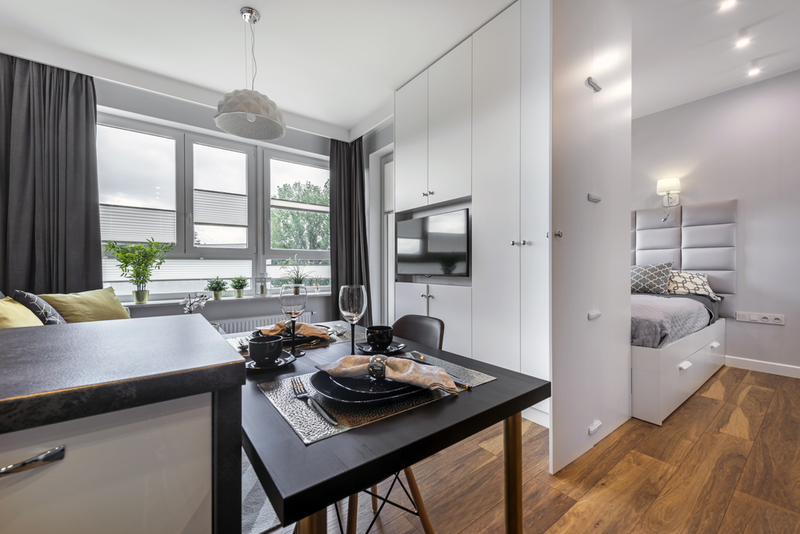 If you’re buying a small home, it’s worth making the most of the space. There are a range of clever design trends to maximise usage. There are fold down work spaces that when packed up act as a bookcase, but when pulled down in a section become a desk. There are raised platform dining spaces that have under floor storage built in. There’s built-in bench seating that doubles as storage. There’s also a lot of convertible furniture – movable walls that can convert a space from living to sleeping. It’s an emerging area and more and more products are being released all the time. I recently saw an example of this in a design magazine that showed a dining table hidden into the frame of a kitchen bench, so it can be pulled out at meal times and put away at other times to allow room to move. Small doesn’t have to be bad. In growing cities like Sydney, it’s a necessity. The key is to do it well. I spotted a listing last year for a unit in an inner-city suburb that was obviously proving to be a tough sell. It was a bit above 30 square-meters. A newspaper actually did the calculations and determined that it was so tiny that you literally couldn’t swing a cat in it. It sold eventually, but the time it sat on the market hinted that it was obviously a hard slog for the agent. It wasn’t just small, but it was pokey. Poor natural light, a clumsy configuration and few redeeming qualities. In contrast, a few months earlier, I was reading about another very small unit a few suburbs over that had won numerous awards and sold quickly. The difference? The owner had embraced the space. It was small, but they enlisted a designer to make the most of it, using sliding room dividers to enable the occupants to have multiple uses, along with clever storage. They made it bright and inviting. They made it functional. It was funky and cool. And that’s the point really. At the end of the day, it doesn’t matter how big a place is if it’s unpleasant to be in. Spotting clever design and the nuanced approaches to layout and light can take an experienced eye. If you’d like help to discover a livable home that offer big use of a smaller space, contact us and we’ll help you unearth a valuable diamond among the coal.